BYOD (bring your own device) is sweeping the nation and bringing with it numerous benefits. It can save organizations big bucks on mobile device expenses and make your employees and/or students grin from ear to ear. Nevertheless as with everything else in life, there are some possible challenges concerning BYOD policy and implementation making it a bit debatable as to whether or not BYOD is really worth all the fuss. BYOD is accelerating proliferation is hitting almost all industries, healthcare, education, business, etc. So regardless of the whether you want to allow BYOD or not, brace yourself because BYOD is coming whether you approve and plan for it or not.With all the questions and concerns surrounding BYOD we thought we would gather some popular BYOD infographics to hopefully cover some of your questions. Be prepared, some of the inforgraphics contain some pretty eye-opening facts. 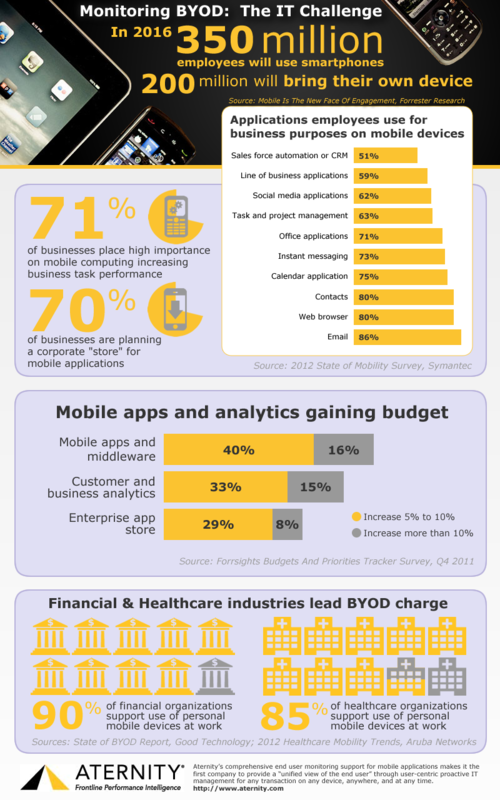 So as you can see from some of the information above, BYOD is on the rise and it's here to stay. Wireless network security and the overload of mobile devices on the wireless network system are some of the main concerns for many organizations. That's were we can help.Here at SecurEdge Networks, we are experts in building completely secure wireless networks and always plan for the future of mobile devices. If you have any questions or would like a free consultation contact us here or download one of our free resources. Good luck!